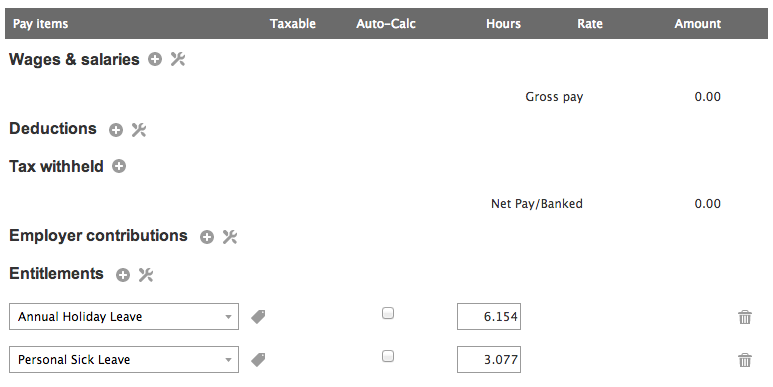 You may need to capture the balances for year to date payroll for your staff. This can be important when needing to report at year end to your tax authority or for ensuring that staff payslips show the correct year to date balances. 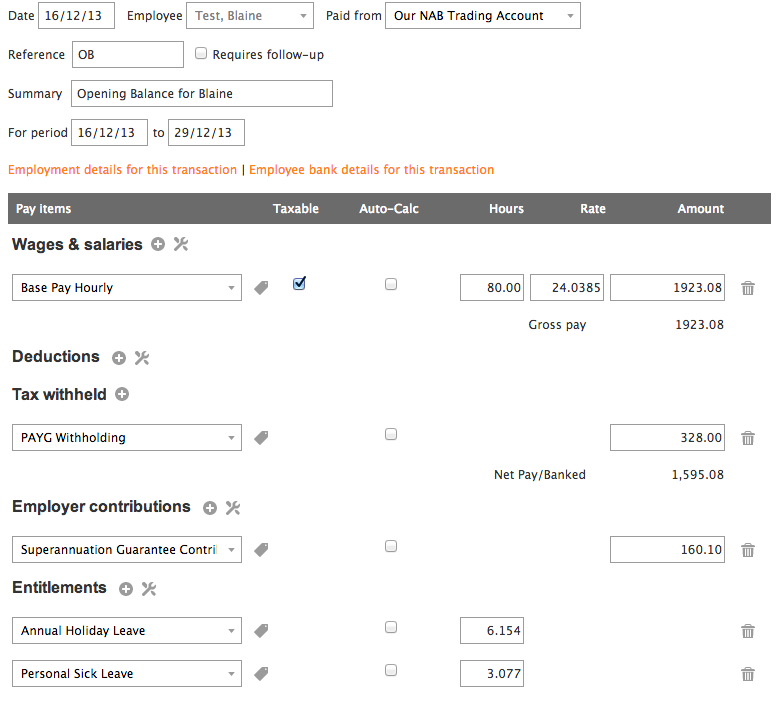 Select Add > Payroll from the main menu. Enter the date to be the start/changeover date for your file. Select the employee from the Employee pick list. Ensure Auto Calc is NOT ticked for the Wages and Salary, Deductions, Tax Withheld and Employer Contributions pay items. Manually enter the figures from the previous accounting system into the fields for each of these pay items. Similarly, ensure Auto Calc is NOT ticked for the Entitlements pay items. Enter the number of hours from the previous accounting system into the fields for each of the Entitlements. Repeat the above process for all employees. If you are entering opening balances for accounts via the Setup Opening Balances screen, you may want to run the General Ledger Detail report to see the postings for these payroll entries and make adjustments to your Asset, Expense and Liabilityopening balance entries accordingly. When you move to Saasu from your old accounting system you may wish to capture historical accrued leave. This help note covers this scenario. Enter the date as the start/changeover date for your file. Remove any default pay items for Wages and Salary, Deductions and Tax Withheld that are already set for the particular employee. Ensure Auto Calc is NOT ticked for the Entitlements pay items. Repeat this process for all the employees.